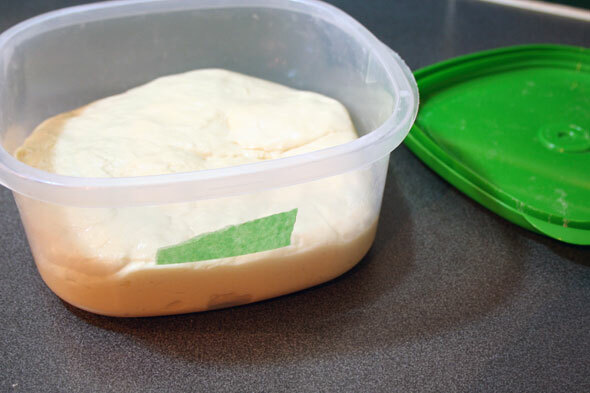 Once the Pâte was taken from the refrigerator, it was cut up into pieces so it would warm up more evenly and quickly. I’m using the flour I’ll be mixing up for the dough to drench the pieces so they don’t stick. Once cut and coated, they sit under an inverted plastic bowl for about an hour until warmed. And now, we’re ready to start. As always, the Mis. What we have here: Bread flour, the Pâte chunks, water, sugar, malt syrup, salt, instant yeast, melted butter and one slightly beaten egg. 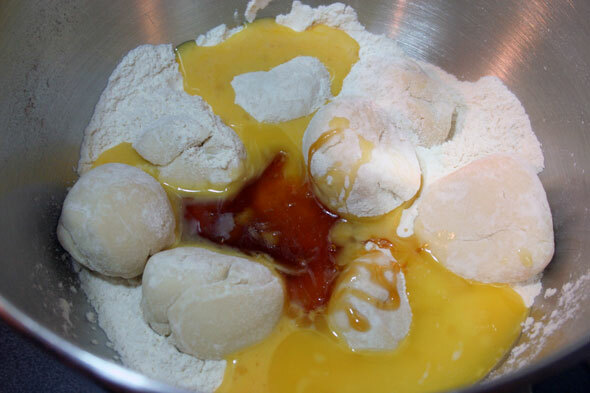 As usual, we stir the dry ingredients together, add the liquids and mix until the dough comes together into a rough ball. 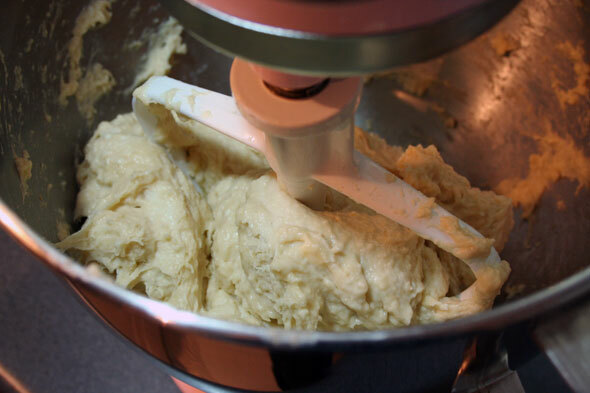 We then switch to the dough hook and knead for 6 minutes (would have been about 10 minutes if done by hand). 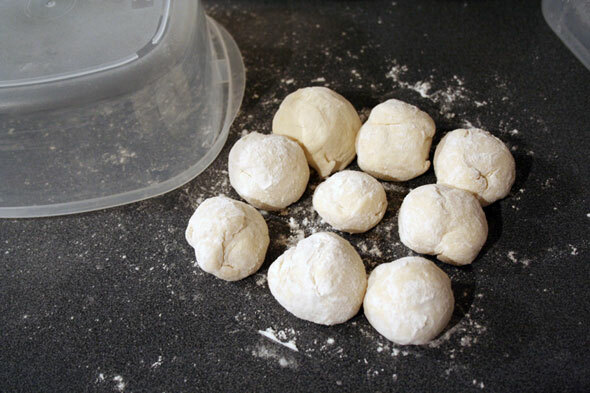 Once the dough has been kneaded, reached about 78ºF and passes the windowpane test, it is placed in an oiled bowl and allowed to bulk proof for 2 hours or until it has doubled. 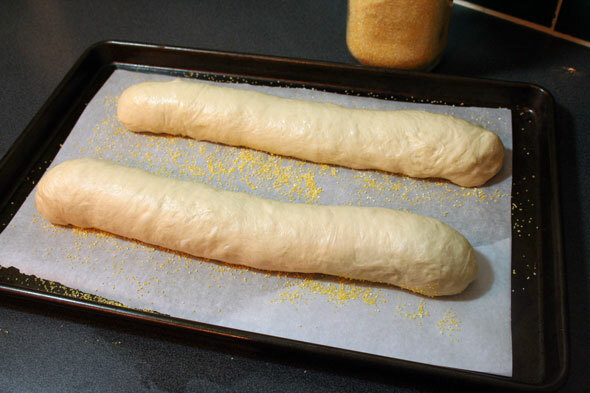 Once doubled we’re ready to shape the loaves. 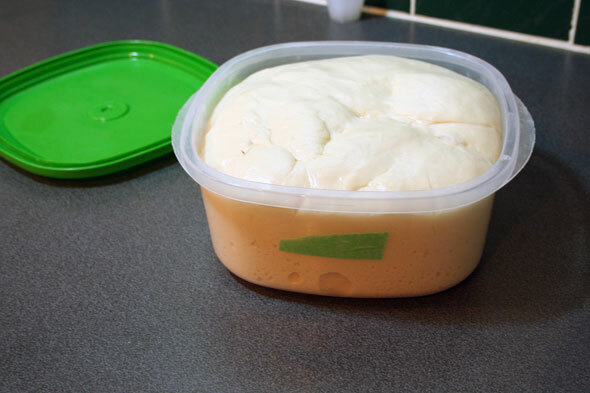 The raised dough is turned out onto the counter and (not shown) sliced in two. 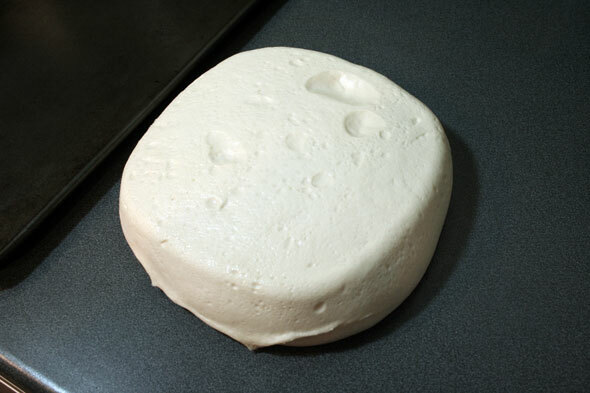 I did this by eye but you may want to weigh the dough before cutting then split it into two precisely equal pieces. 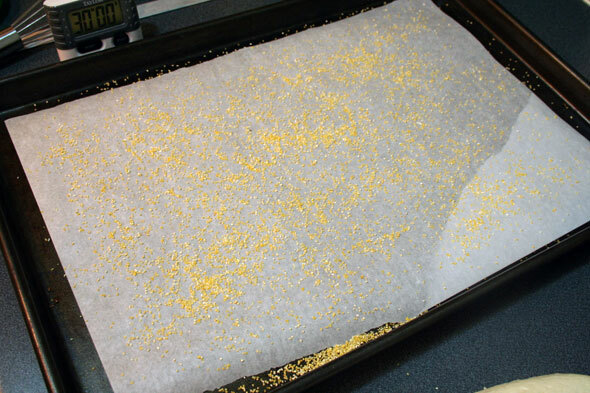 Also, I’ve prepared the tray with parchment paper sprinkled with coarse corn meal. I shaped the two halves of dough into simple loaf shapes. I decided later on that it would have been better to shape them into batards which are pointier at the ends but fatter in the center. Not a huge issue either way. 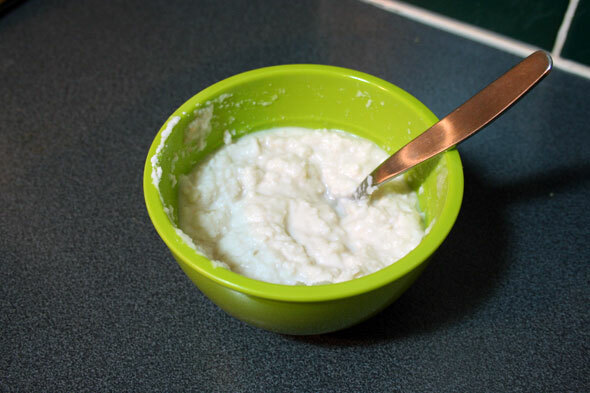 In the green bowl is our “Dutch Crunch” paste which is a little thicker than sour cream. I chose to make 2/3 of the recipe noted in the book’s Grace Notes for Dutch Crunch. Since I was coating only two loaves, I thought it would be wasteful to make enough for four, which the amounts given are said to cover. And just to be sure I didn’t get too short, I made 2/3 of it. 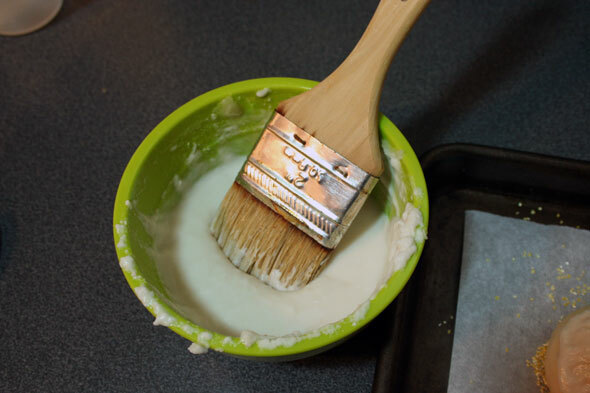 Here I’ve started painting the Dutch Crunch paste over about ¾ of the first loaf. This is pretty straight forward. After painting both loaves, I had barely used any of the Crunch stuff. And I had painted it on rather thick too. 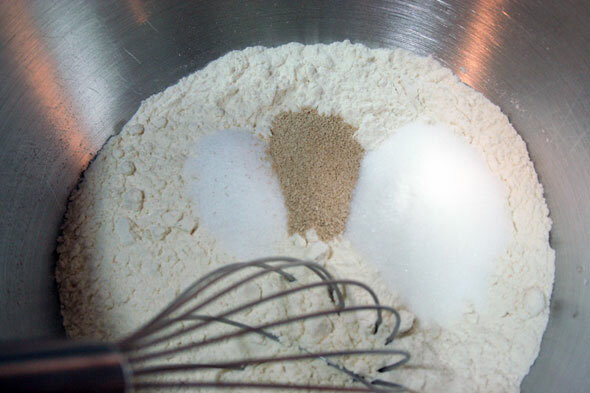 Since this mix has instant yeast in it, that would not be able to last very long so this leftover mix would need to be tossed. 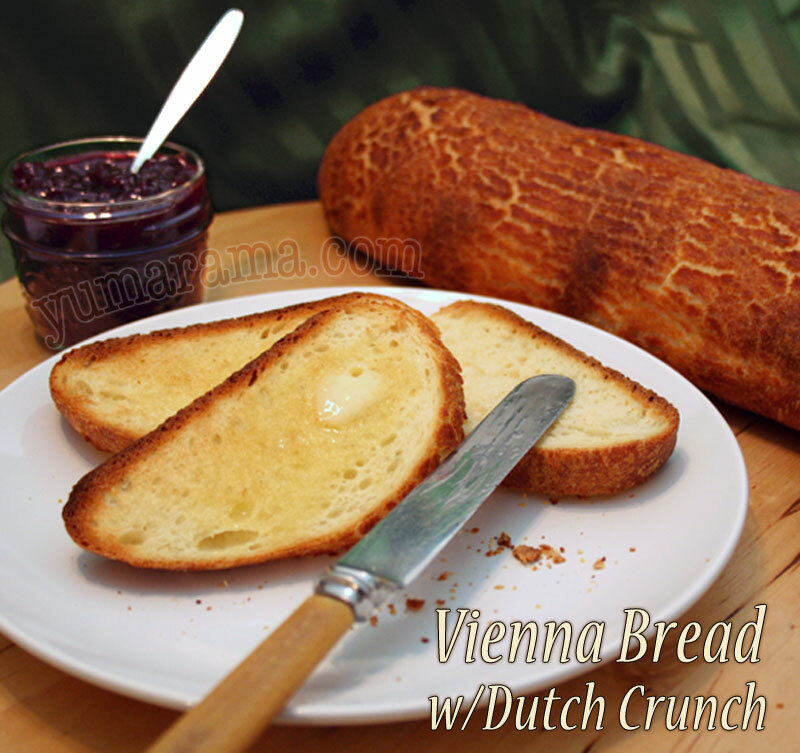 So there’s a pro tip for those of you making this bread and using the Dutch Crunch: cut the recipe in half or even to 1/3 and you’ll still have enough for the two loaves. There’s our shaped loaves, all painted up with Crunch and ready to do Final Proof. And to do that, I inverted another big plastic tub over the top since covering the Crunch goo with plastic wrap would have been rather counterproductive. The loaves do their final proof for 60-90 minutes until they are 1¾ times their original size. At the 60 minute point I checked to see if they were ready. They had grown but weren’t really ready. Note the Dutch Crunch paste has started to dry up a little and beginning to crackle as the dough below expands. During this time I also pre-heated the oven after placing the baking stone and a cast iron fry pan (for steam) in the oven and turned it on to 450ºF. It will take almost an hour to preheat the oven stone properly. 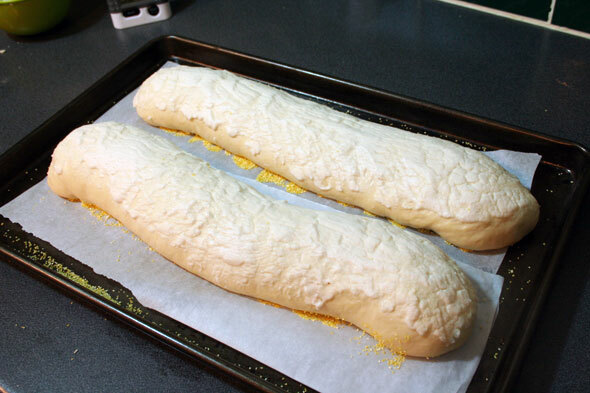 At the 90 minute mark, the loaves seem to have expanded to about 1¾ as suggested. 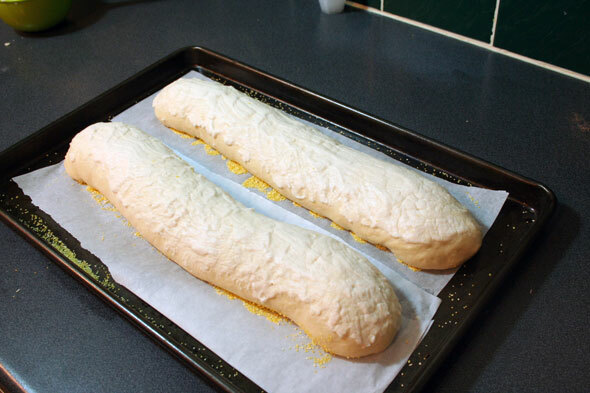 I’ve sliced the parchment paper in two to make handling the two loaves easier. I place them on the peel one at a time and put them in the hot oven and directly onto the hot stone one after the other. 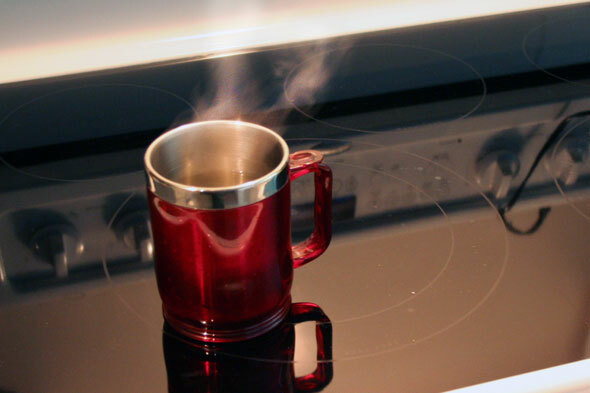 I’ve also just boiled some water and it’s waiting on top of the stove for me. Once the two loaves are in, I grab a towel, open the oven door, drape the towel over the glass and toss the cup of boiling wwater into the now very hot empty cast iron fry pan. Immediately the oven billows in steam so DO BE CAREFUL here! This is very hot! The towel over the door is to prevent some of the water from dripping or splashing onto the equally hot inside oven glass and cracking it. A little prevention save ruining the brad, needing a new sheet of glass (not cheap I hear!) and basically funking up the whole bread process for you. for the day and likely the rest of the week since a new door glass isn’t likely to show up tomorrow. OK, steam blast taken care of, we let the dough bake at 450 for 10 minutes and then go in and, with the help of our handy peel, spin the breads around so they bake evenly. Once that’s done, there another 10-20 minutes more of baking but my loaves were well done and 205ºF inside (the book wants “at least 200ºF”) so we’re actualy done, even with up to 11 more minutes left. And there they are, hot out of the oven. 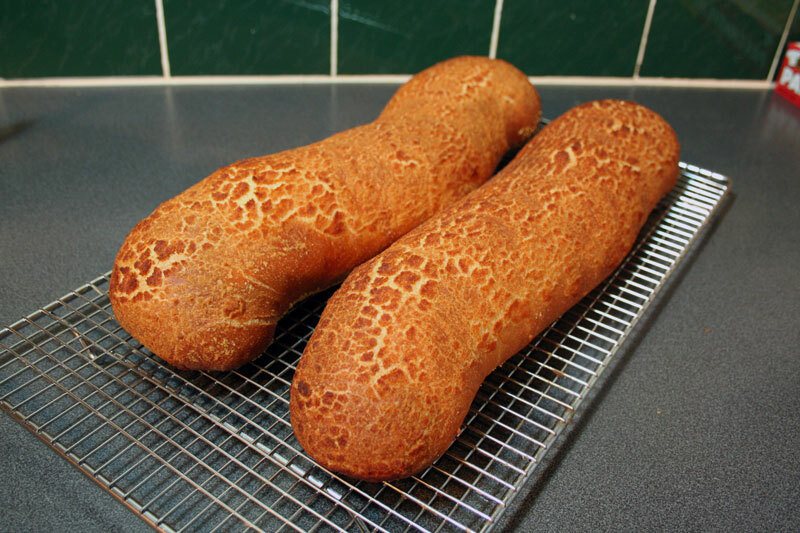 Nicely browned – perhaps a touch much, the bottom of one loaf is edging on somewhat dark – smelling delicious and looking wuite interesting with the panther-like texture. I think I’ll make a point of scoring these next time. Those of you following along in the book may note a slight similarity with that photo. The crumb is soft and rather tight with no large pockets. the crust in general is thin but crunchy. The Dutch Crunch topping add a little zing of flavour (the baked rice flour) along with a hint of salty and sweet. None of this is overpowering and this bread would be good with either savoury meats or sweet jams. Or as I went for the instant I had done this photo, just a swab of butter or a dollop of jam was quite fine. I may or may not have eaten a good portion of this loaf, like maybe a third, all at once. I was very happy with this bread and it’s a wonder there’s any left for breakfast in the morning. I think I can be fairly certain that this is The Best Bread in the BBA, beating out even the amazing Italian Bread. I may want to do both side by side at some point to really compare them off each other since it’s been several months since I made the Italian. But right now, I’ve got this one pegged right at the top. 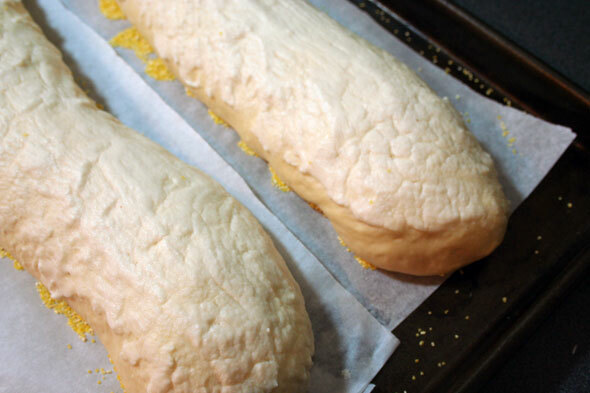 Other than making the loaves a different shape, trying a slash through the Dutch Crunch and cutting back on the rice paste to avoid tossing the excess, I had no problems with this bread and wouldn’t want to change anything. It’s really quite lovely as is. Now the only issue I have is how to keep it fresh over the next day or so, assuming it survives that long, while keeping the nice light crunch of the crust and crispy nuttiness of the topping. I’ve got both loaves in a big paper bag right at the moment ands hope this will keep the crust crispy while not letting the bread dry out. It’s a yeast bread so it’s not as forgiving of long stays on the counter as sourdough. So we’ll see how the paper bag thing works out. I’ll try to get people’s suggestions on this storing issue. 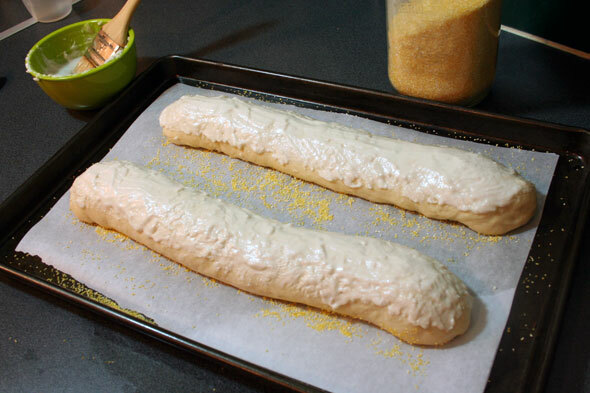 Next bread coming up: White Breads, Three variations. I will do that as it’s time to give sandwich-type breads another go for the sliced white fan in the house. “What happened to the breads you skipped?” Honestly, they were just not appealing. The Tuscan saltless is really getting bad reviews, a couple need ingredients I do’t have on hand like candied fruits and brandy for the Stollen and I doubt that will get eaten here. So instead of getting annoyed with tossing the better part of some good bread loaves away, I’d just as soon pass over them. Again maybe I’ll come back and give them a whirl at another point. But not now. And besides, I’m REALLY itching to be able to make other breads I want to make, not necessarily what’s up next in the book. Phyl at Of Cabbages and King Cakes just posted this one (with Dutch Crunch) and agrees it’s an excellent one. Sally at Bewitching Kitchen says this is one of her favourites. Hers is without Dutch Crunch. Oggie of I Can Do That! puts this one in her Top Ten from the BBA Challenge. Hers is also without Dutch Crunch. AP269 at Family & Food did a triple bake with this + Tuscan + White breads. I have my pate fermentee warming on the counter. I can’t cook at midnight, five in the morning, no problem. I plan on making pistolets, but your crumb is beautiful. I will have to try this again, with 1/3 of the topping. Beautiful bread, and great write-up! I made this twice already, and after writing my blog post and reading yours, I’m thinking it may be time to make it again. Thanks for the shout out, too! I’m afeared these two loaves are gonna be gone pretty fast. So a second batch may be a good idea, if I have the time. BUT then I have to also look at what bread is coming up next weekend. We can only eat so much bread, there being just two of us. I also popped these loaves into a paper bag and that, overnight, seems to have kept the crust’s crunch without losing the freshness. Day one, at least. I had also wrapped a small plastic bag over the cut end that covered an inch or two of the crust. When I took the plastic bag off today, the crust inside had gone completely soft. Glad I didn’t pop the whole loaf into a plastic bag. So now i’m wondering how this would keep if I had to freeze the extra loaf. Would it completely lose it’s crispiness? That would so defeat the point. 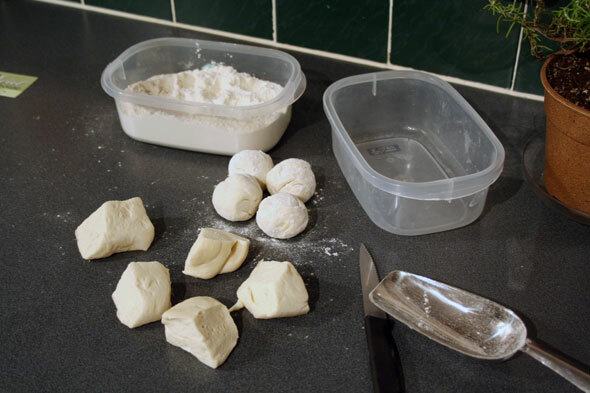 Maybe freeze it before bagging… then thaw it out of the bag later? 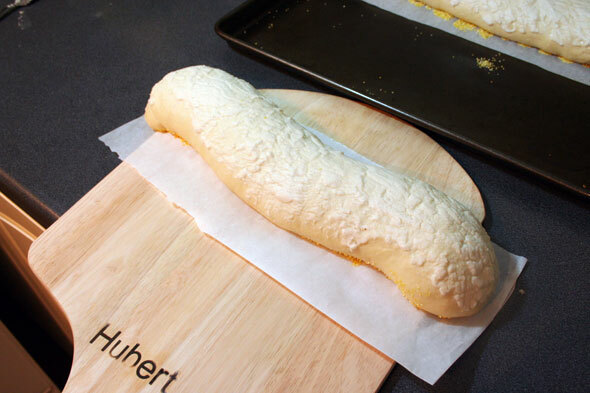 I’m eager to hear the results of your poll about the best way to store the bread . . . I often have trouble keeping it fresh between baking it on a Saturday and wanting to bring some in to my coworkers on Monday. This bread looks and sounds wonderful! Those look so delicious! I can’t wait to make them after reading yours and Phyl’s review. Okay, now I’m getting excited for this bread. When I initially looked through the book it didn’t seem like a very exciting loaf. But after reading yours and Phyl’s rave reviews I’m looking forward to it. The crackled exterior reminds me of that chemical you brush over paint to get that crackled antique look! Your loaves look just wonderful. 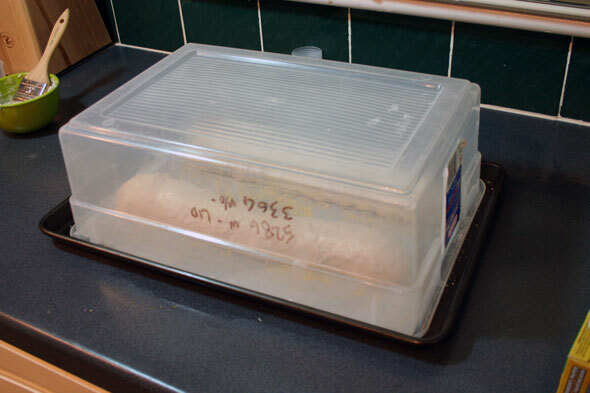 Great idea to cover proofing loaves with upside down container rather than using plastic wrap. This is an excellent write up~ Italian bread has been my favorite so far and I’m looking forward to this bread. Thanks for letting me know that you are skipping a couple of breads….for the same reasons you mentioned, those breads wouldn’t work here at my house. Well, now I want to do it again, but with the crunchy topping…. as soon as the CHallenge is over, I’ll try this again, it was such a tasty bread! Dutch crunch where have you been all of my life! Seriously now, what a wonderful looking bread. Great job explaining the process! Oh how this bread sounds delicious! I love the idea of the topping…looks like it would make a perfect PB+J sandwich. The alligator crackled look is awesome! 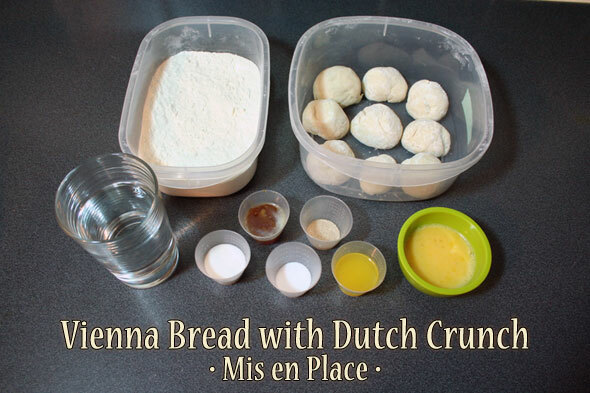 I’ll give the Dutch crunch another try, because my kids will be thrilled about an alligator bread ;-). Thanks for mentioning my post. .-= ap269’s latest blog post: Culinary Tour 2010 – South of the Border: (8) Haiti – Beignets (Sweet Banana Fritters) =-. 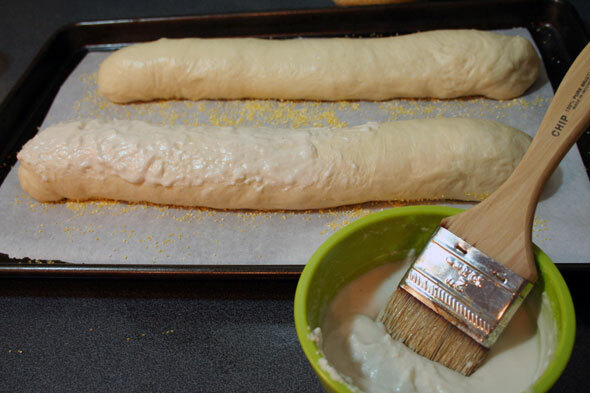 Im looking forward to baking this bread, but could you please give the amounts of the components (of the final dough that is, I’m already past the pete fermentee), or maybe a link to a recipe? It’s a wonderful bread indeed so if you do bake it I’m sure you’ll like it a lot. Sorry I can’t give the recipe away since as part of the Challenge of doing every recipe in The Bread Baker’s Apprentice book, we all agreed that posting the recipes was pretty much a bad way to go since we were supposedly holding the book up as a great resource; giving all the recipes away on the net was counter productive. So we encourage people to go and get the book for themselves so they not only have the recipes but also all the other excellent info that it offers.